It is now crystal clear to every right thinking human being that the actions and inactions of Chief Nnia Nwodo and his Ohaneze Ndigbo led social cultural group has continued to be a threat and menace to the Biafra restoration struggle. Nnia Nwodo has been openly and covertly working against the genuine will of the people of Biafra in his numerous activities in recent time such as the political gathering he has been hosting in Biafraland which is geared towards supporting the existence of Nigeria as against the will of the people of Biafra to restoring their own sovereign state that was destroyed by the British colonial masters. But before the advent and creation of Nigeria Biafra was and will reign forever. "Leadership can be defined as the ability of an individual or a group of individuals to influence and guide followers or other members of an organization. It is also involved in making good decisions, creating and articulating a clear vision, establishing achievable goals and providing followers with the knowledge and tools necessary to achieve those goals and theirs too". Now, let us concentrate on the activities of Nnia Nwodo led Ohaneze Ndigbo since he took over the mantle of leadership as the President general of a social cultural group. As a leader of this group, what has Nnia Nwodo done for the Igbo people of Biafra through his group or the kind of achievement or development he has attracted to his people using his good office from the Nigerian government? Has Nnia Nwodo tried in all sincerity of mind and purpose to voice out the minds of his people or present their demands to the Nigerian government without the fear of being reaped off his political status or being intimidated? Intelligent reports earlier stated that Nwodo is one of those that masterminded the Nigerian military OPERATION PYTHON DANCE II, that took the life of not less than 100 Igbo (Biafran) youths in Umuahia and beyond from September to November 2017. And I asked, is this the kind of gift Nnia Nwodo brought to the people he is leading? During the invasion of Nnamdi Kanu's home in Afara ukwu Ibeku in Umuahia province of Biafraland by the Nigerian military, many families lost their beloved ones and were also deprived the joy of having their loved ones with them. Since that ill-fated and ill-conceived operation Python Dance took place, none of the so-called Ohaneze Ndigbo members or their leadership has questioned the Nigerian government pertaining that operation or has condemned the killing of innocent youths, none has asked the whereabouts of their son Mazi Nnamdi Kanu and his parents. Therefore, calling for any Nigerian summit or political gathering without minding or taking note of both the positive or negative effects such gathering will have on the indigenous people of the land is a disservice to the people they are representing and such can not be tolerated in Biafraland anymore. Ohaneze Ndigbo led by Nnia Nwodo do not have the goodwill or interest of Igbo population world wide at heart, hence the reason they will always work against the collective will or interest of the people. Ohaneze Ndigbo in connivance with Nigerian combined military forces masterminded the killing and untimely death of Biafran youths through many military operations that have been launched in the South East in recent time. Ohaneze Ndigbo should note that the day restructuring died was the day they allowed the Nigerian military forces to invaded Nnamdi Kanu's home, kidnapped him and his parents and has remained criminally silent towards such act. Finally, Ohaneze Ndigbo by their actions are not the mouthpiece of Igbo people of Biafra hence, have no mandate to host any Nigerian restructuring summit in Biafraland without considering the demands of indigenous people of the land and their unfettered quest for Biafra Referendum to decide their fate. Therefore, IPOB stance not to allow any pro Nigeria political gathering or summit by Ohaneze Ndigbo to hold in any part of Biafra is where I stand too. Such a baseless political gathering is always geared towards damaging the strides and successes made so far by Indigenous People Of Biafra in their quest for a sovereign nation; Biafra. 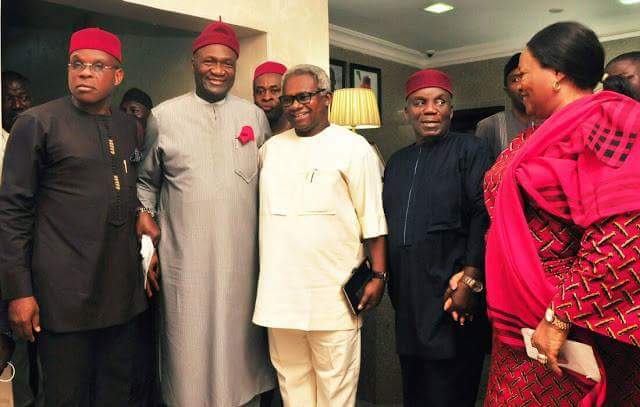 However, Ohaneze Ndigbo led by Nnia Nwodo is advised to join hands with IPOB in demanding from the Nigerian government to produce Mazi Nnamdi Kanu and his parents and as well seek for a referendum date to be fixed so that the Biafran people will determine their fate in the Luggardian creation called Nigeria instead of clamoring and begging the Northern Oligarchy for restructuring of Nigeria.